A child's vision is one of their most valuable assets. Optimal vision is essential for proper developmental progression in many areas from motor skill development to reading and even behavior. By age four, children have typically attained 20/20 acuity and should have early control over eye movements, meaning they can use their eyes to look around without turning their head. Between four and 10-years-old, this ocular motor control will continue to improve as their brain and sensory motor systems develop. 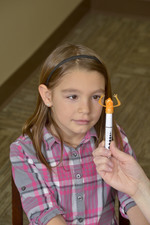 While many children may only need glasses to correct acuity issues, other children may suffer from eye movement problems that make it impossible for their eyes to work together and send messages to their brain correctly. It can be difficult to know if your child is having these types of problems as many children have no complaints about their vision because they simply don't realize they are seeing things differently than their peers. Other children may complain of headaches, moving objects, burning eyes, wiggling lines or floating words. Because children may have a difficult time telling you they’re struggling with their vision, you may need to do some detective work. Children with vision problems may be struggling with academics, including learning to read or writing with numerous letter reversals. They may also rub their eyes frequently while reading or tilt their head or cover an eye while completing their homework. In terms of daily living activities, these children may have difficulty locating their toys when searching their bedroom or become car sick more often than other children. Their motor skills may also be impacted with difficulties with tasks like catching a ball or completing age-appropriate puzzles. Some children with vision problems may even demonstrate highly active or inattentive behavior leading parents and teachers to question the presence of ADHD. While some of the issues can be both frustrating and alarming, often these issues can be explained by impairments in visual skills such as impaired tracking, convergence or accommodation. These problems frequently arise due to weak eye muscles and can be corrected with treatment aimed at strengthening those muscles and improving how the eyes work together. Occupational therapists are trained to provide treatment addressing visual motor deficits. These interventions, often covered by medical insurance, can make significant and lasting impacts in a short period of time, with appropriate carryover of home exercise programs.